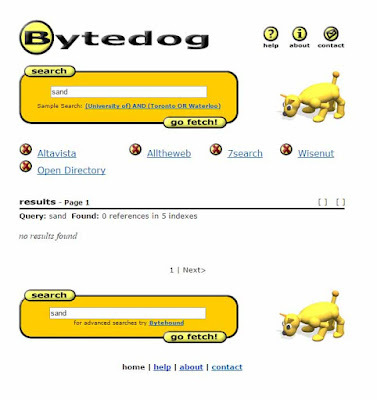 Bytedog was founded in 2000 by John Perieteanu, Shaun Chen and Matthew Zukowski and was based in Ontario, Canada. It is a metasearch engine that combines Alta Vista, Alltheweb, 7search, WiseNut and the Open Directory and filters "bad" results (see: Levine et al and the Bytedog "About" page). On the results page, the user can select a single search engine or combine them. 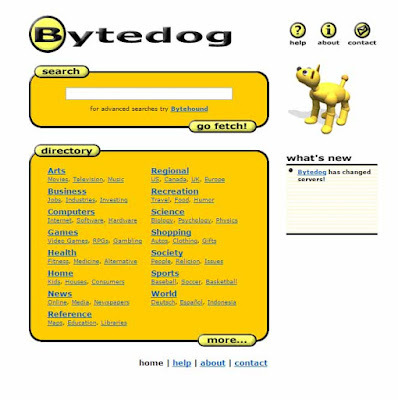 Today Bytedog looks a bit like a ghost search engine. The input page of the search is still available, but doesn't return any more results, perhaps because the search engines contained here are all no longer available today.